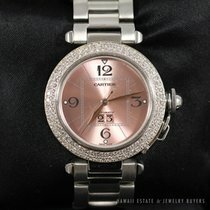 Unisex Mid-Size Cartier Pasha C Big Date in Stainless Steel. Auto w/ Sweep Seconds and Date. 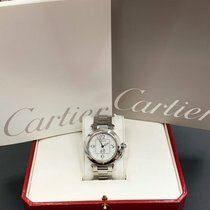 Certified Preowned Cartier Pasha 2475 watch is made out of Stainless steel on a Stainless steel Link Band with Stainless Steel Double Fold Hidden Clasp. 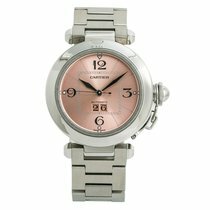 35 mm case with Round Case Back and Pink Arabic Stick Dial, Scratch Resistant Sapphire Crystal, Smooth Stainless Steel Bezel, Automatic Movement. Watch has been inspected, serviced, polished and refinished by Daoud's certified Swiss watchmakers and includes Daoud's 2 year mechanical warranty.